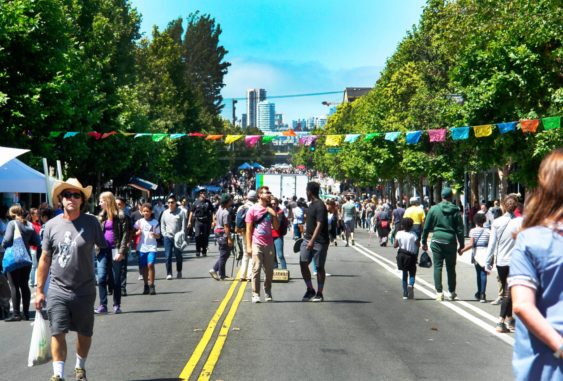 Livable City is thrilled to return to its newest route in SoMa on August 18, creating car-free open streets on Folsom Street from Essex to 10th! Dance the night away at DNA Lounge, visit the collection at the Prelinger Library, tour world-class museums and arts centers like MoMa, The Contemporary Jewish Museum, The Museum of the African Diaspora and Yerba Buena Center for the Arts. Enjoy a meal at SoMa Streat Food Park. Support community organizations like United Playaz and the Pilipino Senior Resource Center. And don’t forget to explore the area’s tucked-away alleys, expansive murals, small businesses and turn-of-the-century industrial architecture.